Ford's 100 years in photos 9/52 | What Car? This week's photo is from 2011 and celebrates 80 years of production in Britain with a Model Y. 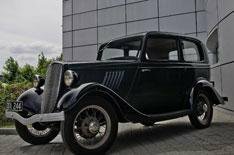 The Model Y was introduced in 1935 and offered four seats for 100. It stands in front of the Dagenham Diesel Centre, which was opened in 2003. Although Ford no longer builds cars in this country, the diesel centre is capable of producing a million engines a year for use around the world. Click here to see last week's picture of a flying Ford Cortina.